This is a superb and magnificent letter written from a former slave to his former master in a response to a request to return as a “free” man and employee, no longer as a slave. When I reached the apex of the letter, which is a request of “some proof that you were disposed to treat us justly and kindly”, I laughed out loud with rejoice and respect for the writer’s forethought to do so – in addition to being a passive way of humiliating the former slave owner. I did some checking around about this letter and it does appear to be legitimate. 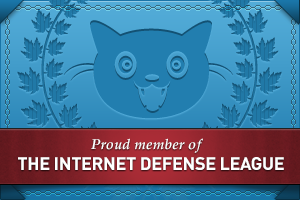 Here is a thread on Snopes, if you care to check it out. Thanks to Eideard for posting this letter and bringing it to my attention. Sir: I got your letter and was glad to find you had not forgotten Jourdon, and that you wanted me to come back and live with you again, promising to do better for me than anybody else can. I have often felt uneasy about you. I thought the Yankees would have hung you long before this for harboring Rebs they found at your house. I suppose they never heard about your going to Col. Martin’s to kill the Union soldier that was left by his company in their stable. Although you shot at me twice before I left you, I did not want to hear of your being hurt, and am glad you are still living. It would do me good to go back to the dear old home again and see Miss Mary and Miss Martha and Allen, Esther, Green, and Lee. Give my love to them all, and tell them I hope we will meet in the better world, if not in this. I would have come back to see you all when I was working in Nashville, but one of the neighbors told me Henry intended to shoot me if he ever got a chance. I want to know particularly what the good chance is you propose to give me. I am doing tolerably well here; I get $25 a month, with victuals and clothing; have a comfortable home for Mandy (the folks here call her Mrs. Anderson), and the children, Milly, Jane and Grundy, go to school and are learning well; the teacher says Grundy has a head for a preacher. They go to Sunday-School, and Mandy and me attend church regularly. 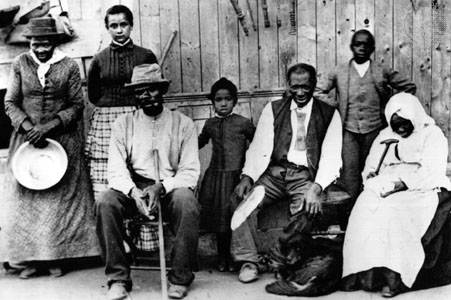 We are kindly treated; sometimes we overhear others saying, “Them colored people were slaves” down in Tennessee. The children feel hurt when they hear such remarks, but I tell them it was no disgrace in Tennessee to belong to Col. Anderson. Many darkies would have been proud, as I used to was, to call you master. Now, if you will write and say what wages you will give me, I will be better able to decide whether it would be to my advantage to move back again. As to my freedom, which you say I can have, there is nothing to be gained on that score, as I got my free-papers in 1864 from the Provost-Marshal-General of the Department at Nashville. Mandy says she would be afraid to go back without some proof that you are sincerely disposed to treat us justly and kindly — and we have concluded to test your sincerity by asking you to send us our wages for the time we served you. This will make us forget and forgive old scores, and rely on your justice and friendship in the future. I served you faithfully for thirty-two years and Mandy twenty years. At $25 a month for me, and $2 a week for Mandy, our earnings would amount to $11,680. Add to this the interest for the time our wages has been kept back and deduct what you paid for our clothing and three doctor’s visits to me, and pulling a tooth for Mandy, and the balance will show what we are in justice entitled to. Please send the money by Adams Express, in care of V. Winters, esq, Dayton, Ohio. If you fail to pay us for faithful labors in the past we can have little faith in your promises in the future. We trust the good Maker has opened your eyes to the wrongs which you and your fathers have done to me and my fathers, in making us toil for you for generations without recompense. Here I draw my wages every Saturday night, but in Tennessee there was never any pay day for the negroes any more than for the horses and cows. Surely there will be a day of reckoning for those who defraud the laborer of his hire. In answering this letter please state if there would be any safety for my Milly and Jane, who are now grown up and both good-looking girls. You know how it was with poor Matilda and Catherine. I would rather stay here and starve and die if it comes to that than have my girls brought to shame by the violence and wickedness of their young masters. You will also please state if there has been any schools opened for the colored children in your neighborhood, the great desire of my life now is to give my children an education, and have them form virtuous habits. 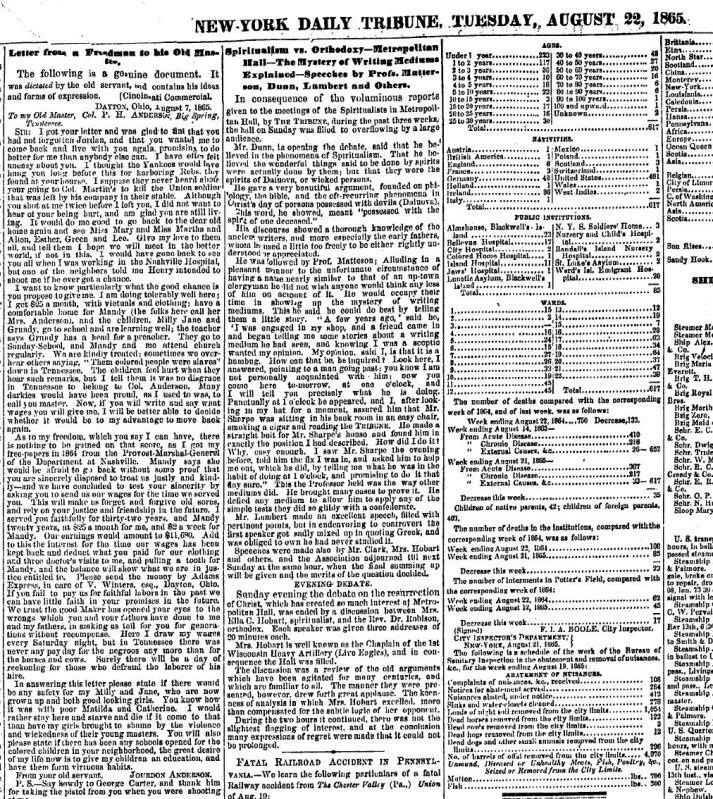 Here is a photo of the page in the New-York Daily Tribune on Tuesday, August 22, 1865. I just wish I could have been a fly on the wall when the ol’ Colonel read it. Harriet Jacobs’ “Incidents in the Life of a Slave Girl” contains some riveting back-and-forth correspondence between an escaped slave and the slave-owning family, which is similar in some ways to this. There have been some very brave people speaking truth to power. I love historical every day life items like that. Very fascinating. Such an interesting comparison to people and society now. The values are so different. This sort of thing is far more instructive than any history text. Wish I’d had more material like this when I was hating history in school. Me, too. But then, I had a history teacher that was as boring as watching the grass grow. Same with poli sci. 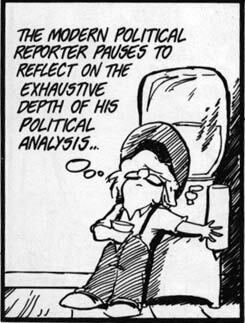 If I’d had a more interesting teacher, I would have been hooked on politics back in high school. This is great and thanks for posting! No problem. And I have a boss now that I’d love to write something rather similar to.